Travel guide: How to do 48 hours in Boston when you're broke AF. Welcome to the first post of my new Broke AF Travel series, where I talk about how it's actually possible to travel when you're as broke as I am! And if I can do it, you can, too. First, I just quickly need to brag about the fact that my round-trip transportation from Buffalo to Boston cost me a total of…~~$129~~ That’s an $86 flight there and a $43 bus ride back home. If you add in the hostel, which was $40 a night (actually a pretty pricey hostel compared to what a typical hostel will cost you) and ya girl got to explore Boston for two days for just over $200. Now, I know what you’re thinking. $200 doesn’t sound super cheap when you lump it all together like that. Like, who just has an extra $200 laying around that they’re not using? Especially if you’re anything like me- living on a retail job income and still crying over the $127 that comes out of my bank account every month for my student loans, even though I’ve been out of college for a year now. It’s fine, I’m fine. But all things considered, for a quick little two-day vacay, that’s a pretty darn good deal. If you're one of those people (like I used to be) that thinks you can’t travel because it’s too expensive- I promise, you can. Although it was admittedly a little more pricey than what I was originally hoping for, I opted for a hostel for this trip instead of an Air BnB or other form of accommodation mostly because I didn’t know how exactly my first solo trip was going to go. I wanted to have a sense of community and people around me in case things went wrong. Plus the location was perfect- right in the heart of downtown Boston near Chinatown. I walked literally everywhere I wanted to go and spent exactly $0 on Ubers. Okay, I actually took a Lyft from the airport to the hostel but I’m not counting that. One of my biggest regrets of the entire trip was not talking to more people in the hostel or trying to get to know anyone there. I would have loved the chance to go on one of their guided tours, bar crawls, etc., but it really just didn’t line up with the things I wanted to do for myself. Plus the first night I was so ridiculously tired and jet-lagged that I felt like a zombie and just wanted to eat pizza and lay in bed. And that’s what I did. Hence the beauty of solo travel- I can do whatever the eff I want. So there. It was super touristy, crowded, and loud, but I wasn’t about to visit Boston and not go to Quincy Market. Quincy Market has basically every type of food you could ever offer your girlfriend and she still wouldn’t know what she wants. And basically any piece of clothing you could ever want with the words “I love Boston” written on it. Oh, and I forgot they actually like the Patriots there?? So that was weird. If you walk in aimlessly and not knowing what exactly you’re looking for, much like I did, Quincy Market can be a little overwhelming. Don't get me wrong, it's definitely cute, just a lot to take in. I did, however, score this mini cannoli (which was freaking delightful) for $1 so I can’t really complain too much, right? My only regret is that I didn’t get two of them. Next time. If you’re like me and really like the farmer’s market type of vibe but aren’t really into all the tourists and crowds, just walk a few blocks down and meet Quincy Market’s chill little sister, Boston Public Market. 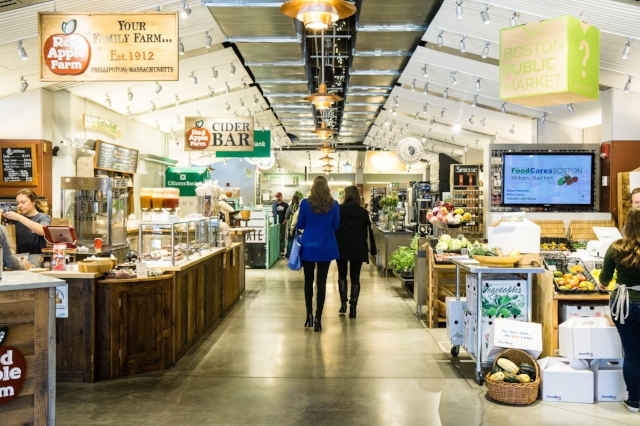 Home to 40+ local vendors, Boston Public Market gave me that cute, local feel I was looking for. Not that there’s anything wrong with the touristy stuff, if that’s your jam. I swear I took pictures while I was there but now they are nowhere to be found. Please enjoy this pic from their website. They had a local beer selection so I picked Matt up a tall boy of a local brew as a souvenir (for the life of me I can’t remember what it was right now- but it was an amber ale of some sort), got my mom some locally made chocolate from Taza Chocolate, and successfully talked myself down from buying ALL the succulents on display by reasoning with myself that they wouldn’t survive the 12-hour bus ride home. Good job, me. I realize that at age 22, it’s probably super weird for me to still love going to aquariums and zoos as much as I do, to the point where I’ll go to one alone. I guess I just don’t understand why the idea of being able to pet a stingray is typically not as exciting to anyone else my age?? But that’s fine. I’ll pet the cute water puppies and you can do whatever it is you want to do. Yes, this was one of the more expensive things I did, but I was able to get a student discount, making my admission $25 instead of $27 (yes I still use my old college ID to get discounts). It's not that big of a discount, but two dollars is two dollars, people. That’s two more mini cannolis from Quincy Market right there. Always got food on the brain. Beacon Hill was the actual cutest neighborhood I’ve ever been to- super cute, quiet, and ALL the cobblestone streets, coffee shops and friendly people. People that I talked to in downtown Boston were fine, it’s not like they were super rude or anything, I’m just saying that no one on the whole trip was as nice to me as the owner of Peet’s Coffee on Charles Street in Beacon Hill was. We started chatting after he tried to get me to start a rewards card with them- I mentioned I wasn’t actually from the area so it wouldn’t really do me any good. We talked about Beacon Hill and other Boston things, and the conversation ended with him thanking me for making his shop a part of my first Boston experience and giving me a sample of dark roast since I only ordered food and not a drink. My dude. Think Boston's version of Central Park, with nuggets of history scattered all around. Cute and touristy- worth it to go walk around and drink your coffee or whatever. Free AF. Just as amazing as it is chilling- a must-see if you're ever in Boston. Open 24 hours a day. Also free AF. Boston's third-oldest cemetery that houses the final resting place of a handful of famous Americans, including Paul Revere, Samuel Adams, John Hancock, and more. Again, FREE AF. Pro Tip: I probably would've tried to do a guided tour for this one. It's really cool to just walk through and look around, but I feel like I could have appreciated it more if I knew the history behind everything instead of being like...Wow, that looks old. Cool. Plus I think the tour guides were dressed up in costumes so like, that's cool? If you're into that sort of thing. Chinatown was just a block away from my hostel, so I obviously had to check that out too. Nothing too crazy in terms of shops, food, and bubble tea options, but that massive front gate is really cool. Insta-worthy and, once again, FREE. AF. Sorry for yelling I just really want you all to know that most of what I did was either so freaking cheap or so freaking FREE. And honestly, that's one of the awesome things I've discovered about travel within the last couple of months- it's probably not as expensive as you think. Sure, to get the better deals you might have to be a little flexible, get creative when planning your days, and maybe even swap a boujee private hotel room for a cozy hostel dorm- but it's definitely doable and 100% worth it. If I, the girl who only has $146 to her name right now (I just checked) can travel, you definitely can, too. Or, at the very least, you can probably afford some mini cannolis.